When it comes to retailing, around 30% of store-based (excluding non-store retailing) retail value in Malaysia are contributed by grocery retailers while the rest are from non-grocery retailers. 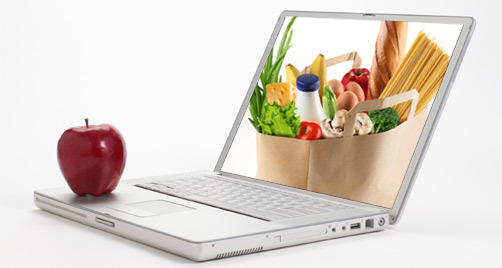 No doubt, grocery is a big but price-sensitive segment, so let's scrutinize grocery's online potential here especially with the launch of Tesco Online Grocery Home Shopping (GHS) service. GHS service started since April 2013 and officially launched its service to cover Klang Valley in June 2013. Tesco is the no.2 retailer in Malaysia behind GCH Retail (who owns Giant, Cold Storage, Guardian). Tesco's strongest competitor, Giant is a strong local brand (even though after being acquired by Dairy Farm Group in 1999) and synonymous with "everyday low prices", while Tesco is arguably stronger in building customer loyalty. On another hand, Giant has many more outlets compared to Tesco whose outlets are only located in Peninsula, non in East Malaysia yet. In order to compete with Giant and gaining market share, it is sensible that Tesco needs to expand fast by opening more new outlets both in Peninsula and East Malaysia. On top of that, offering competitive prices plus variety, via private label range (Tesco Value, Tesco Choice etc) is crucial for Tesco's growth. 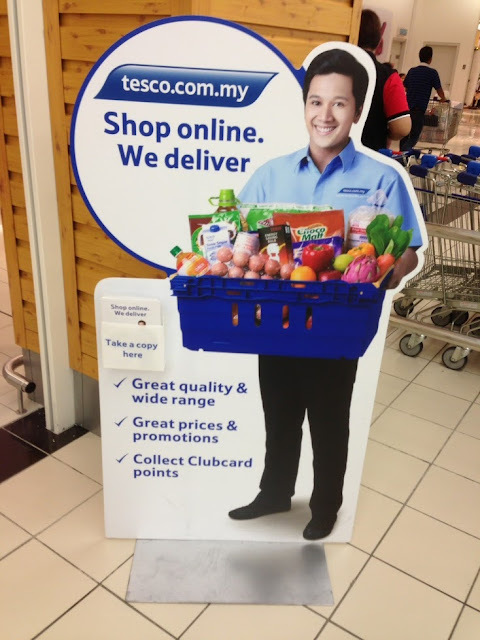 Here, we have to applaud Tesco for becoming the first mover among the market leaders here to setup online shopping service, even though Internet retailing is insignificant for groceries in Malaysia, well at least for now. Tesco Online Shopping - how serious they are? If you have visited Tesco stores recently, you can hardly miss the POP display within their stores. We have to wonder, are they just trying to convert their offline customers to online's? How about acquiring new customers (from Giant, AEON etc)? It is only recently that Tesco advertises its online shopping service on newspapers with RM 20 coupon. Anyway, GHS service is still considered new in the market and we should expect more A&P activities from Tesco. The online business setup is impressive though, which they claim to have more than 15,000 products available online, from fresh food, grocery goods, chilled & frozen to health & beauty ranges. The only setback is there isn't any product description available yet. Pricing wise, it is similar with offline prices and read here for some price comparisons with other online grocers. As most of you know, GHS service is currently covering Klang Valley only, which is fulfilled by 4 stores - Tesco Extra Mutiara Damansara, Tesco Extra Cheras, Tesco Extra Puchong and Tesco Klang. Tesco is expecting to extend its coverage to Penang and Johor by February 2014. We have 150 staff comprising personal shoppers who are trained to pick groceries in good condition and with the longest expiration date as well as customer delivery assistants to deliver the goods in the best condition possible. To add on that, Tesco has started with 5 temperature-controlled trucks earlier in April. It is confirmed - their setup is big, their investment is huge, and they are dead serious. How many big retailers in Malaysia are as serious as Tesco? Personally I have to admit, Tesco is not my first choice when it comes to grocery shopping but I have always wanted to try their GHS service. The RM 20 coupon has just forced me into it, so it kinda works. 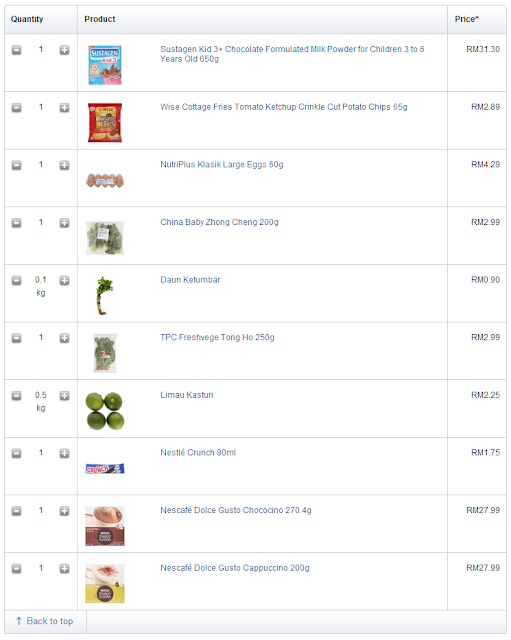 Selecting products (apart from the non-existence of product description) and ordering online from Tesco is a smooth experience, but I had decided to throw them a challenge by ordering perishable goods like vegetables, mixed with some usual grocery stuffs, plus eggs and an ice-cream! You can check my shopping cart below. Tesco doesn't accept payment online and only collect payment (via credit cards only at the moment) upon delivery, in short it is a full COD (Cash on Delivery) model, and they collect RM 10 service fees for this. 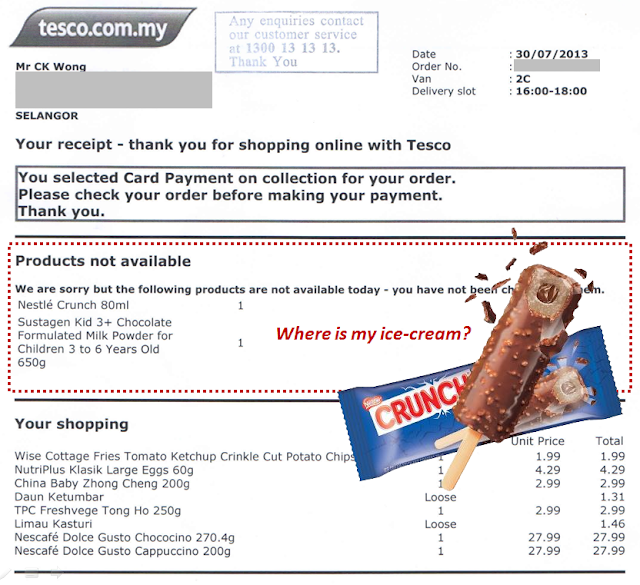 Why Tesco doesn't collect online payment first? This is because the price might change on the day the products are delivered, and other factors like weighed products or stock is unavailable. The best part of Tesco's COD service is you can select time-slot delivery, any available 2 hours slot from 10am to 10pm, 7 days a week. So, I selected a 4pm to 6pm slot, next day delivery. On the subsequent day, Tesco's temperature-controlled truck did arrive on time. In case you are wondering, there are 3 partitions in the truck: room temperature section for my usual grocery stuff, chilled section for my vegetables, and frozen section for my ice-cream (supposedly). So I checked on the vegetables, eggs - all in good conditions but one thing is missing, the ice cream! 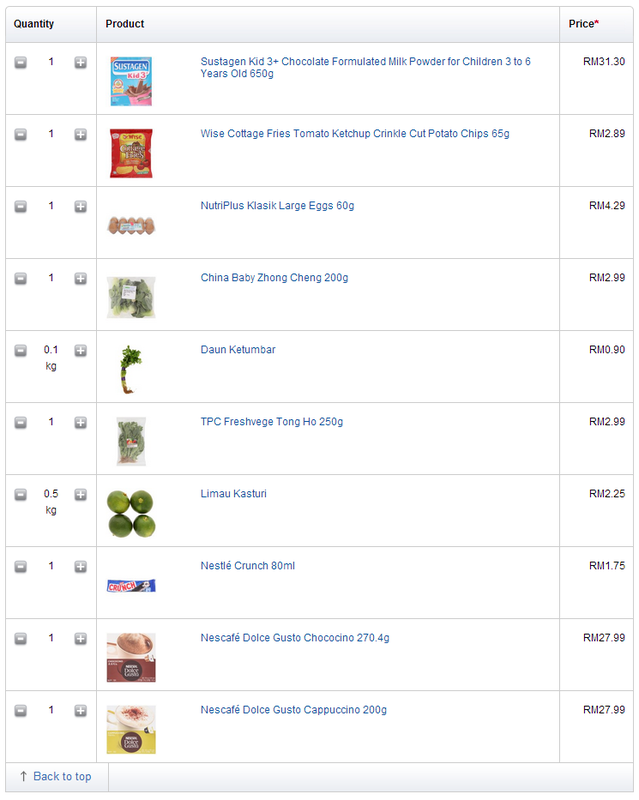 They didn't deliver the formulated milk powder too. I then asked the delivery assistant (note: he is a friendly guy), and he said he's not sure why but probably due to no stock. It will be quite amazing if the whole Tesco Extra Mutiara Damansara doesn't carry a single bar of my ice-cream. My own guess is they were just avoiding the hassle of picking or delivering a bar of ice-cream but why list it online in the first place? OK, forget about ice-cream challenge, more importantly I am clueless on why the formulated milk powder was not being delivered. Anyway I proceed with the payment via the wireless credit card terminal their delivery assistant was carrying, and you don't need to pay for the items that are not delivered, or those you wish to reject. I did a quick chat with the delivery assistant, which he shared that Tesco has 10 temperature-controlled trucks for GHS (not using at full capacity yet) at the moment, with 7 or 8 delivery assistants working on 2 shifts. When asked about order or fulfillment volume, the delivery assistant said "50 to 70 orders a day", as opposed to 100 orders a day claimed by Tesco Malaysia CEO, Georg Fischer earlier in June. In overall, it is a pleasant online shopping experience by Tesco and hopefully it will help boosting the public confidence to shop online. The only small setback is the unfulfilled products, which could affect the service reliability. The other one would be the payment method, we are not sure on why cash is not accepted yet upon delivery, could it be security reasons? On the positive note, Tesco's fulfillment setup is quite impressive, perhaps they have more temperature-controlled trucks than TA-Q-BIN now! If TA-Q-BIN is not growing here, it will be challenging for the online chilled & frozen food segment to grow too, particularly smaller businesses. Last but not least, Tesco applies a bold strategy to convert its offline customers to online's, which we can observe some sort of resistance by certain local big retailers, especially those with franchises. They should really take a a look at Tesco's commitment and investment into e-commerce, and look further ahead into the future.